This week has gone by in a flash! Or is it like a flash? I'm never sure. In any case, this week is always such a busy week in our household, we celebrate 3 birthdays this week and I always say every year I’m going to be more prepared and organized for everyone’s birthday for next year. I wish I could say this year was different, but nope, I still ended up cramming everything into the last few days, but I got it done! Hubby had a Nacho Libre cake (loves that movie! ), our oldest son had a birthday cake with his driver’s license on it (new driver alert!) 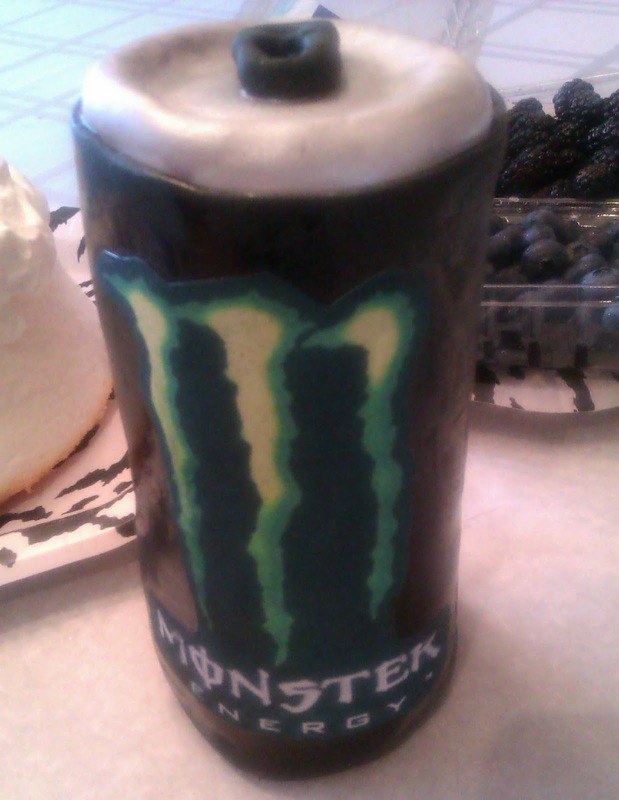 and our other son declared his Monster Energy cake as ‘sick’…I think that's a good thing in teen speak. 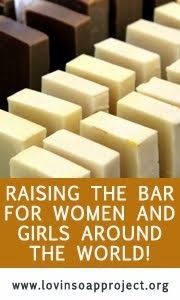 Now, back to the business of Amy’s soap challenges! I can't believe we have completed 3 weeks already! This week was the mica swirl, and I was really looking forward to trying this one. I have seen Emily (Shieh Design Studio) and Celine (Soaperstar) doing these tops, and I am crazy about this look and have wanted to try this technique for a while. I’m really looking forward to giving the leopard spots a try again next week, wish me luck! Until next week...hope you all have a great weekend! I absolutely love that sushi cake! It is awesome. Also, your soap is beautiful, as always. I can't wait to try the mica swirl tops, too... This is a fun challenge. Thanks Chrissy, good luck with your soap! 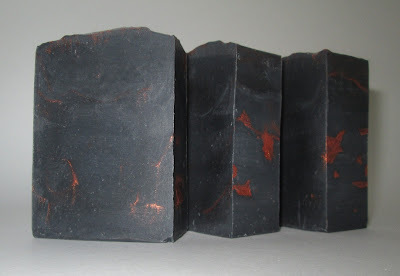 How dark soap and the mica stands out really beautifully. But what does it smell like? (Trying to smell all the way to Canada). The cakes are phenomenal! 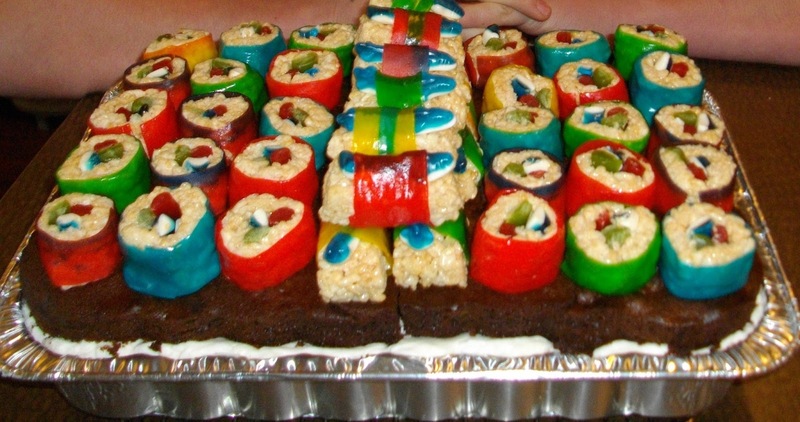 How did you make the rice for your sushi cake? Perfect! Really like how you reinvent the oil mica application! Thank you so much Emily, your video demonstrating this technique was super helpful! Wow, the top is stunnig, Cee! 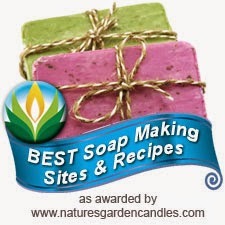 Good luck Nat, can't wait to see your soap! Gogrgeous top! What is this black,an oxide? It's soooo black,love it! You're great not only with soaps, but the cakes, as well. 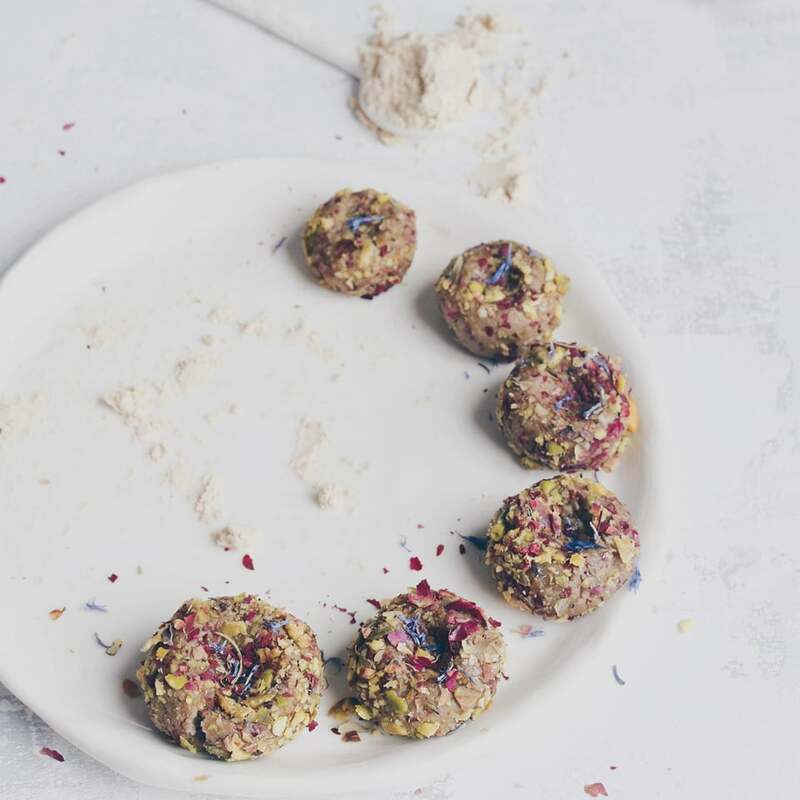 You draw inspiration form both, each direction: cake to soap and soap to cake, interesting! The top is striking with the copper mica...gorgeous! The sushi cake is just..wow..you're very talented! Oh love that shimmery mica vein Cee Gee, just lovely! And the birthday cakes are great! Like you we celebrate 3 birthdays in one week in April in our family, yes it was busy here too! love it! thanks for a fun post! Thanks Anna, so many birthdays in one week definitely presents a unique challenge...lol! Happy belated birthday to your clan! Your soap reminds me of an erupting volcano, is that the look you were going for? It's beautiful, love the mica veins. And your cakes, holy cow you are talented! Thank you Monica :) I didn't really have a 'look' in mind...just something dark and smoldering, so it does look very much like a volcano! The sides actually remind me of gold leafing too. Beautiful soap top Cee! 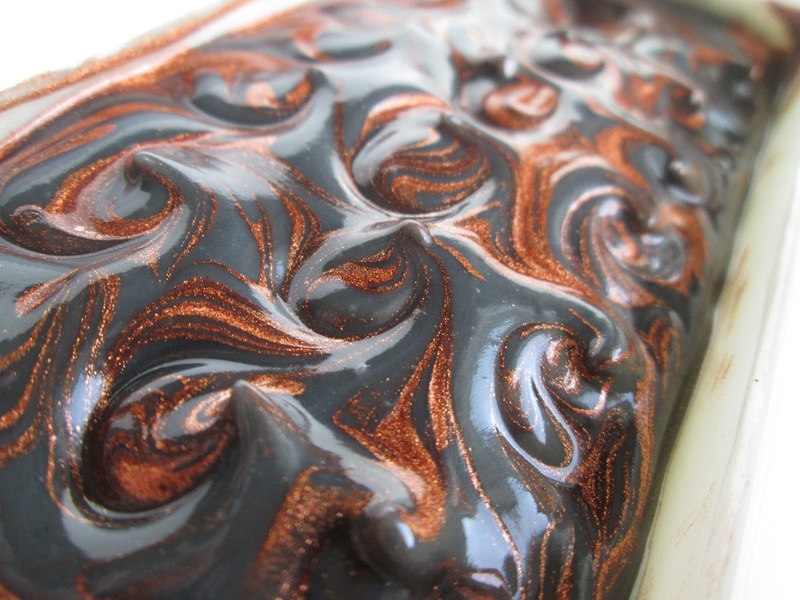 I love the Mica swirl and how you also had it going in the soap as well! Really effective Cee! This dark background perfectly highlights shimmery mica. Thank you very much for sharing those birthday cakes with us – you are really multitalented! Stunning, Cee Gee! The mica swirls on top look gorgeous, and I love the idea of drizzling some of the mica/oil in between the layers. The Monster and sushi cakes are awesome, too. You're so talented at so many things! Thank you so much Jenny and Gordana! I always love your soaps. Those two colors contrast so well! Lovely as always! Black and copper, a stunning combo. Love it! Wow! I must get some copper mica. This is one gorgeous soap!!! Hi there, I tried to 'like' your challenge soap on FB but it wouldn't let me...it's beautiful, the layering is gorgeous and you did a beautiful mica swirl! That mica vein and top is amazing. I'm trying copper next time - it really does hold, well done !! Thanks so much everyone, I really appreciate it! What a fun post!! Gorgeous soap, plus unique birthday cakes all rolled into one! :) You are one talented gal! 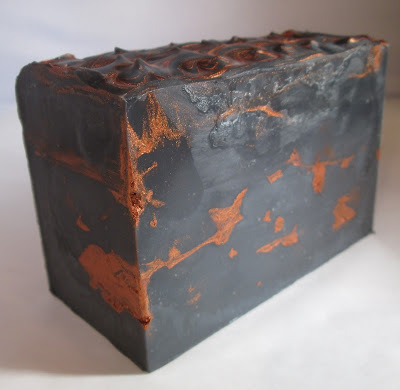 I had wondered how a little bit of mica oil inside the soap might work out - glad you did that little experiment too. What a stunning result! Stunning soap! Love the cakes! You do the most creative projects, Cee! I love the colors you chose for the oil/mica soap. All the best for the leopard spot--I've been wanting to try that technique ever since I saw yours.